Axial deep groove ball bearings comprise shaft locating washers, housing locating washers and ball and cage assemblies. 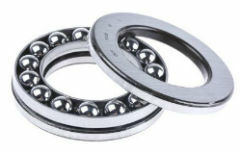 The bearings are not self-retaining; the ball and cage assembly and bearing washers can therefore be fitted separately. In addition to the series with flat washers, series are also available with spherical housing locating washers for the compensation of static angular misalignment. These designs are normally used in conjunction with seating washers. Bearings of series 511, 512, 513 and 514 have a flat housing locating washer. They do not permit angular misalignment or skewing between the shaft and housing.